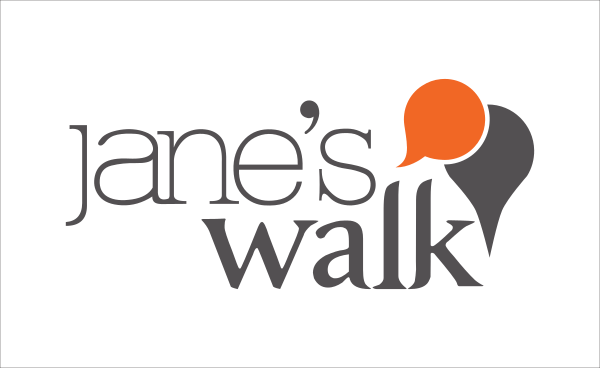 The festivities and walking tours associated with the worldwide Jane’s Walk are over for another year, but that doesn’t mean we should stop discovering our communities! With that in mind, we’d like to share the walk and talk that TransLink’s Debra Rolfe lead during the festival. Below is a step-by-step guide to art found on and around the Expo Line with a few stops in Vancouver and New Westminster. This artwork is part of the Capture Photography Festival, a non-profit annual festival devoted to exhibiting local and international photography. Alinka Echeverría’s Precession of the Feminine is a series of three-dimensional simulations of ceramic vases fused with archival photographs of women and presented against vibrantly coloured backdrops. Echeverría shows her viewers the process behind the creation of these images in order to invite them to look at the unconscious beliefs we bring to viewing photographs, particularly of women. Within the transit context, this project demonstrates one of the goals of TransLink’s public art program to surprise and delight customers, with the layers of meaning in this artwork manifesting differently whether customers pass through the station only once or whether they pass through the station daily. 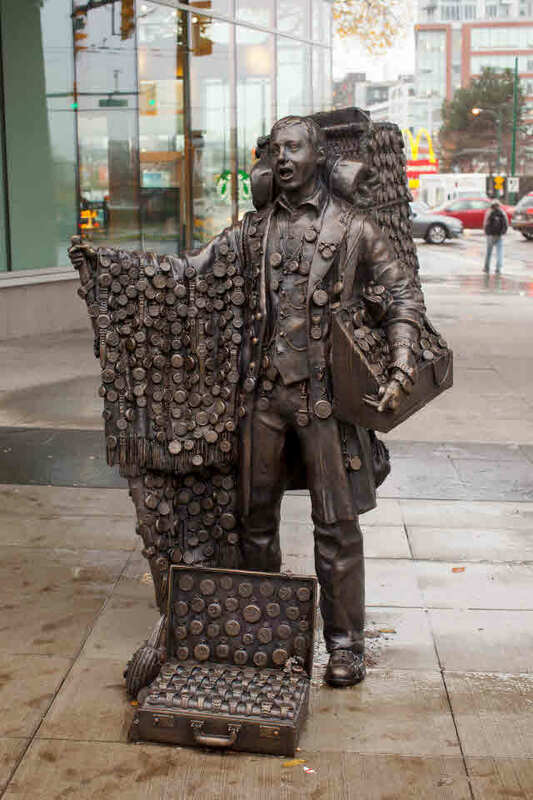 The Watch Seller is a bronze sculpture of a watch seller that functions like a deconstructed public clock. Covered in 720 watch faces, the Watch Seller has every possible minute of a 12-hour analogue clock visible on his figure. He is always out of time, but he also always shows the correct time. These aspects of the artwork reference the shared history of train travel and standardized time, which were invented together in the 19th century. Indeed, standardized time was once called ‘railway time’ and public clocks are a ubiquitous feature of old railway stations. Set at the pedestrian level right outside the station entrance and across Thornton Park from Pacific Central Station, the Watch Seller is the size of a real person. It invites interaction and engagement with the station and the history of rail travel. This series of murals was commissioned in order to improve the experience of the station during renovation and reduce graffiti on the construction hoardings. It was a partnership with the City of Vancouver’s Integrated Graffiti Management Program. Due to the complex nature of the construction process at this station and the expectation that we would have to move the construction hoarding around over time, we asked the artists to create a series of small murals that could be displayed together or separately. Although the artists all worked together and worked with a shared theme and colour palate, they each led on a 12×8 foot section of the mural. The mural’s name and the motif of the SkyTrain windows repeating throughout remind us of the nature of Commercial-Broadway Station as a place of meeting and of departure. This project was a partnership with the City of Vancouver’s Integrated Graffiti Management Program and the Collingwood Neighbourhood House. The artists worked with youth who are newcomers to Canada, including Syrian refugee youth, to develop designs related to the concept of home. Individual children produced drawings that the artists then integrated into the overall design. 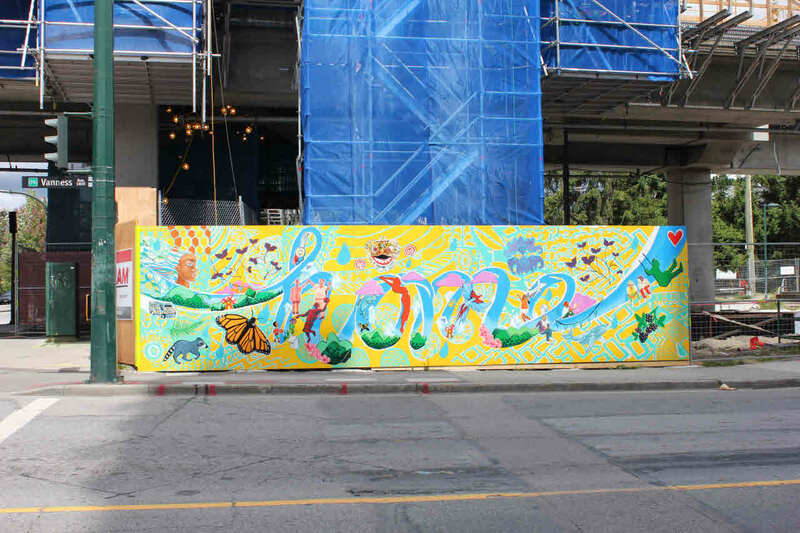 The word ‘home’ in blue, like a river, binds the entire mural together. The mural at New Westminster Station is a collage of archival photographs of New Westminster and elsewhere in BC overlaid with brightly coloured shapes. The flow of images in the artwork references the nearby Fraser River and, as the artist has described it, ‘the simple paradox that [the river] is an ever-changing yet constant presence’. The artwork examines the history of New Westminster and British Columbia as one in which ‘nature’ is transformed into ‘resources’ and how an economy, political power and culture develops from that process. It also brings a beautiful stream of multi-coloured light and images into the station, whereas before the view from this staircase was of the concrete wall next door. Now you’ve got the tools and the information for your own mini-tour of art on transit. Print this out or save it to your phone, grab your Compass Card and get exploring!